Prove that the straight line passing through A(2,3) and B(-4,-6) passes through the origin. 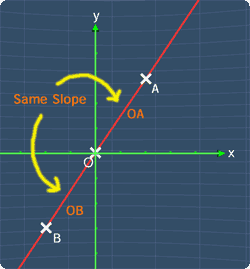 By observing carefully, we can see that if the origin O(0,0) is located on the line AB, the slope of the line segment OA is the same as the slope of the line segment OB. Hence, we can prove this question by showing that the slope of the line OA and OB are the same.